The most expensive thing most Americans own, after their house, is their car. On average, Americans spend 5% of their income on purchasing a car. Another 5% goes towards on-going maintenance and insurance costs. But not every car costs the same to keep it running. And different cars have varying risks of leaving their drivers suddenly immobilized. At YourMechanic, we have a massive dataset of the make and model of the cars we have serviced and the type of maintenance done. We decided to use our data to understand which cars break down the most and have the highest maintenance costs. 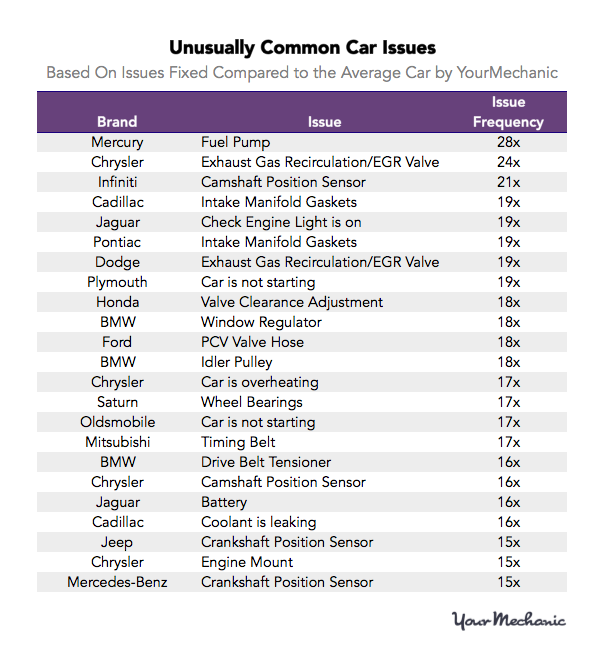 We also looked into which types of maintenance are most common to certain cars. 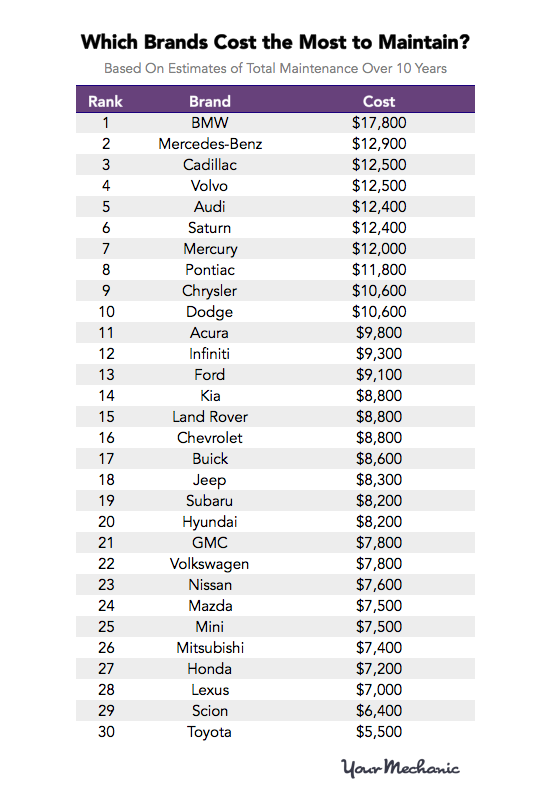 First, we looked at which major brands cost the most to maintain over the first 10 years of a car’s life. We grouped all years of all models by brand to compute their average cost by brand. In order to estimate annual maintenance costs, we found the amount spent on every two oil changes (as oil changes are generally done every six months). Luxury imports from Germany, such as BMW and Mercedes-Benz, along with domestic luxury brand Cadillac, are the most expensive. A Toyota is about $10,000 less expensive over 10 years, just in terms of maintenance. Toyota is by far the most economical manufacturer. Scion and Lexus, the second and third most inexpensive brands, are both made by Toyota. Together, all three are 10% below the average cost. Most domestic brands, like Ford and Dodge, are in the middle of the pack. While luxury cars call for the most expensive maintenance, many budget vehicles rank relatively high. Kia, an entry-level brand, surprises with maintenance costs 1.3 times the average. In this case, sticker prices don’t represent maintenance costs. 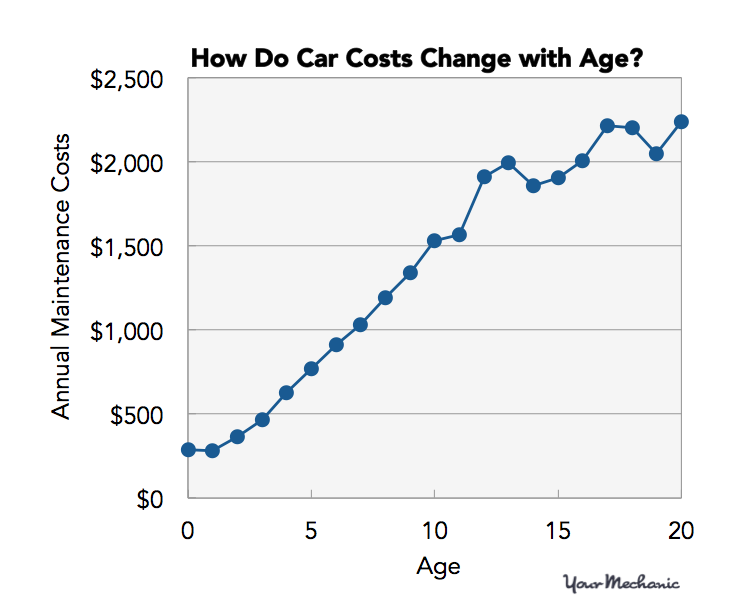 Knowing the relative maintenance costs of brands can be informative, but it’s also important to consider how car costs change with age. 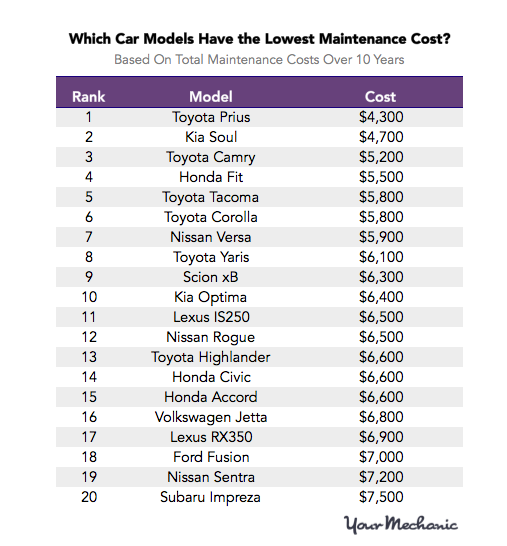 This chart looks at the median annual cost of maintenance across all brands. 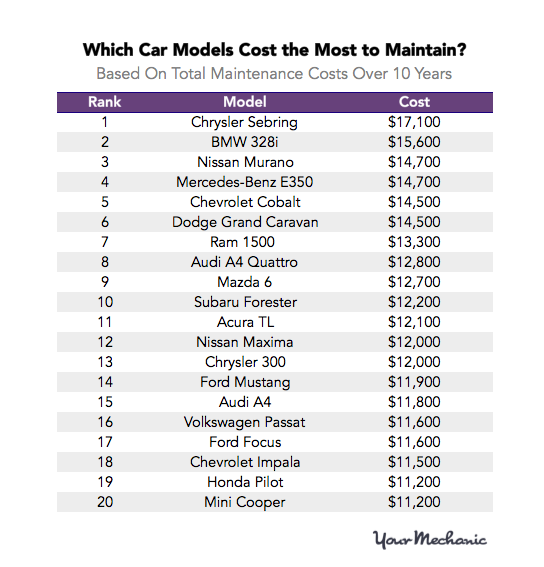 Maintenance costs increase as the car ages. A stable, consistent increase of $150 per year in costs exists for years 1 through 10. After that, there is a distinct jump between 11 and 12 years of age. After age 13, costs plateau around $2,000 per year. This is likely because people disown their cars if maintenance costs are higher than their cars’ worth. Even within brands, not all cars are created equal. How do specific models compare directly to one another? We drilled down by splitting up all cars by model to look at 10 year maintenance costs. The 20 priciest car models in term of maintenance cost all require, at a minimum, a staggering $11,000 to maintain over 10 years. These estimates include expensive one-off costs, like a transmission rebuild, that skew the mean higher. According to our data, Chrysler’s Sebring is the most expensive car to maintain, which is likely why Chrysler revamped it in 2010. German imports (such as BMW’s 328i and Mercedes-Benz’ E350) along with many manufacturers’ luxury or full-sized models (such as the Audi A4 Quattro) are quite expensive as well. Now we know which cars are money pits. So which vehicles are a thrifty, reliable choice? Toyota and other Asian imports are the least expensive cars to maintain, with the Prius living up to its well-known reputation for reliability. Along with many Toyota models, Kia’s Soul and Honda’s Fit hold close to Prius’s low-cost lead. Toyota’s Tacoma and Highlander are also on the low-cost leaderboard, even though the list is dominated by compact and mid-sized sedans. Toyota completely avoids the the most expensive models list. So what, specifically, makes some brands more expensive than others? Some brands have a higher incidence of routine maintenance. But some cars tend to break down in the same way time and again. We looked at which brands have maintenance requirements that occur unusually often for that particular brand. For each brand and issue, we compared the frequency to the average across all the cars we serviced. Mercury is the brand that suffered most chronically from a design flaw; in this case, it had fuel pump issues (Ford Motor Company discontinued Mercury entirely in 2011). We can see some issues cross from brand to brand within the same manufacturer. For example, Dodge and Chrysler, which are both part of the Fiat Chrysler Automobiles (FCA) conglomerate, can’t seem to get their exhaust gas recirculation (EGR) valves working correctly. Their EGRs need to be fixed at roughly 20 times the national average. 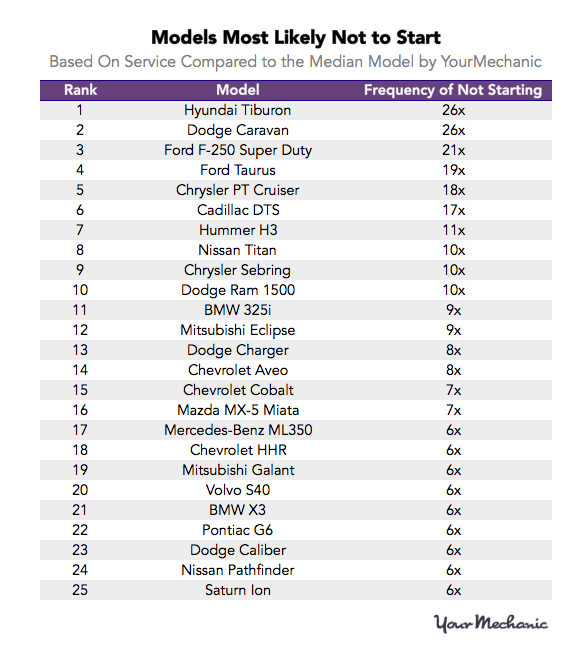 But there’s one problem customers care more about than any other: which cars will just refuse to start? We answer this question in the below chart, which limits the comparison to cars 10 years old or less. Although this could be a reflection of some owners’ diligence just as much as the cars’ build quality, the results of this list are quite damning: 3 of the top 5 brands were discontinued in the last several years. In addition to the now-defunct brands, the premium segment (such as Mercedes-Benz, Land Rover, and BMW) is represented in this list. Notably absent are many of the brands from the least expensive list: Toyota, Honda, and Hyundai. But the brand doesn’t reveal everything about a car. We dove into the models that don’t start with the greatest frequency. The worst cars failed to start 26 times as often as average cars, perhaps explaining why some of these models got the axe: the Hyundai Tiburon, Hummer H3, and Chrysler Sebring (all in the top 10) were discontinued. Some premium models make it into the shameful list as well, including BMWs and several Mercedes-Benz models. For as long as cars have existed, Americans have debated car ownership and the questions of cost and reliability. 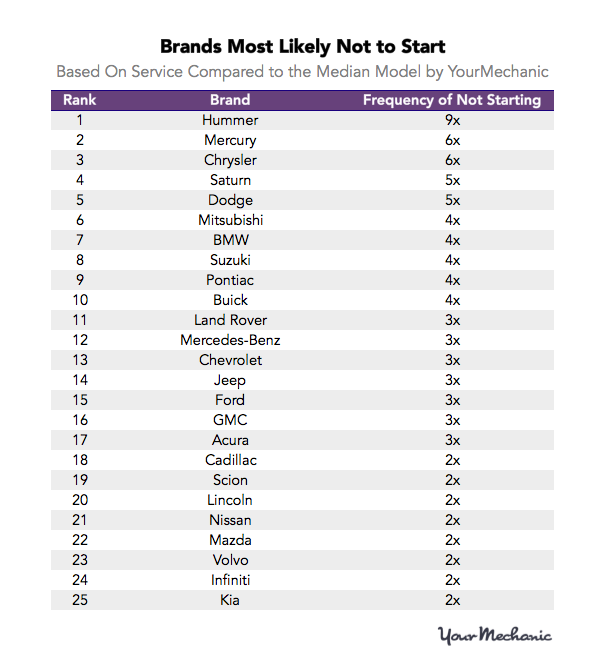 This data reveals which companies live up to their reputation for reliability (Toyota), which brands sacrifice reliability for prestige (BMW and Mercedes-Benz), and which models deserved to be discontinued (the Hummer 3). Still, car maintenance is about much more than the average cost. 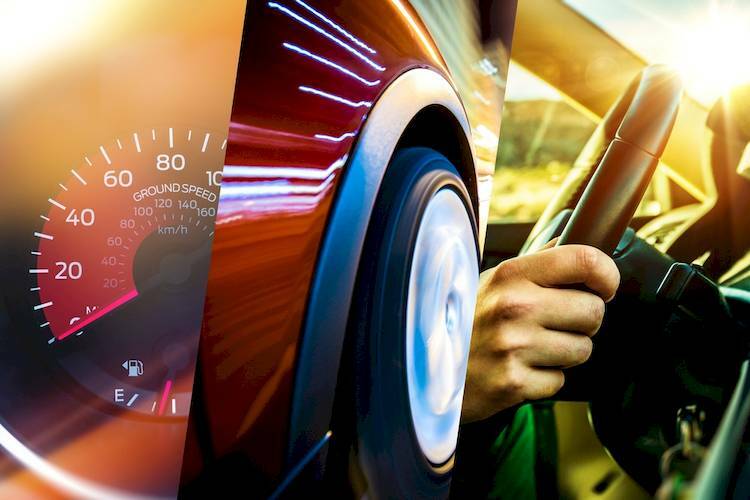 Factors such as how well a car is maintained, how often it is driven, where it is driven, and how it is driven all affect maintenance costs. Your mileage may vary.